Peking duck is not just for special occasions. Peking duck is not just for special occasions. However, because of the price on the menu, you might only reserve it for a birthday celebration, or a graduation party, or as part of a wedding banquet. In any case, if you’ve never had it before, then you’re in for a treat. Peking is the old-fashioned spelling for China’s capital city, Beijing. 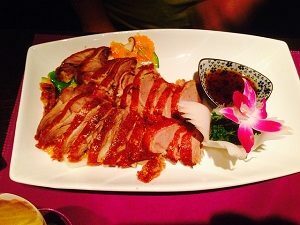 This is where the roasted duck dish comes from, and as it is found in northern China, it is a part of that area’s culinary heritage. So you could conceivably group it with the Hunan cuisine that you have tried in other places before. Roasted duck, thinly-sliced cucumbers, some hoisin sauce, and the pancakes that you can’t miss out on – all of these ingredients help make Peking duck what it is. The sweetness and the crispiness come together to form a delightful crepe packed with flavor that you might not have thought possible. Once upon a time, the Ming dynasty ruled China. Their name meant “bright,” and it was supposed to represent a new beginning for China after the reign of the Mongols through the Yuan dynasty. Cooks and chefs from all across the land converged on the imperial palace, hoping to impress the emperor. After all, only the top chefs could aspire to work in the palace kitchens. It wasn’t until the 1900s, with the end of China’s dynastic period, that Peking duck would make its way out of the Forbidden City and into the wider world. Preparing the duck is time-consuming, and elaborate. If you think about it, it’s almost science, art, and magic all rolled into one delicious delicacy. The duck is pumped full of air that serves to separate the skin of the duck from all the fat that’s hidden underneath. Then, the duck is allowed to air dry before the roasting process begins. This helps make the skin unbelievably crispy and the meat juicy and tender. Once it’s ready, the duck is cut up into over a hundred slices and then it is served with the cucumbers (which are sometimes chopped and diced instead of sliced), the sauces, and the pancakes. It’s possible to find and enjoy some delectable Peking duck everywhere in North America. However, for the truly authentic experience, you will need to go to Beijing yourself. A tiny restaurant called Liqun Peking Duck is your best bet. This entry was posted on Monday, March 18th, 2019 at 3:59 pm . You can follow any responses to this entry through the RSS 2.0 feed. Both comments and pings are currently closed.